Located along the entrance to Clemson University, the Douthit Hills Student Community project sits on over 65 acres of former suburban housing development along SC Highway 93. The project contains eight buildings, seven student housing, and one HUB building containing a residential dining facility, a campus bookstore, a fitness center along with other services for residents in this part of the campus. 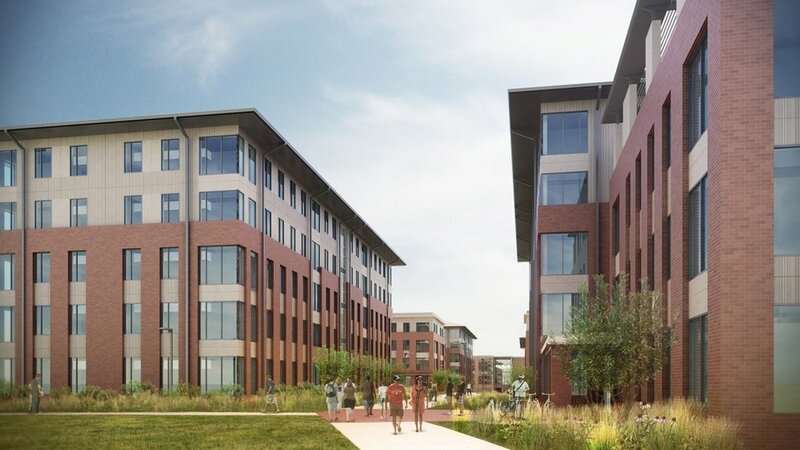 The Douthit Hills Project is Clemson Universities largest ever construction project. The site contained two types of housing, conventional upperclassmen suites, and transitional (bridge) housing for students transferring in from the local community college. This arrangement stressed the importance of creating a landscape that linked the upperclassmen with the campus they have come to know, and introducing and connecting the transitional students with their new environment. This was accomplished through the central location of the HUB building, as well as ensuring that both the upperclassmen and bridge students had exterior spaces to come together. Beginning in 2012, the Douthit Hills project began before my tenure at Ayers Saint Gross. Quickly adapting to an in-progress project, my first major role in 2014 for the Douthit Hills project was to restart the design process after the project went on a year-long hold. Adjusting the design based on budgetary constraints and shifting program from the University, I worked to both advance the construction documents as well as develop presentation graphics and diagrams for meetings with the client and larger design team. These design studies included modifications to the pool landscape, HUB surrounding Landscape, and all of the ADA accessible walkways, and a central pedestrian bridge connecting the west housing to the HUB building. In addition to working on design studies, I oversaw the documentation process from design development through 100% construction documents. This included tree preservation, hardscape, landscape, soils, elevations, details, and FF&E. The final document set was over 50 sheets in length, all organized and developed utilizing a documentation system developed specifically for the project by myself with guidance from senior staff. The organization and sheet structure was unique as it was the largest project ASG-Landscape had undertaken, thus detail references, callouts, and planting plans were necessary to be parametric, and dynamically linked to ensure accuracy across the document set. This documentation methodology was then rolled out to all projects under construction at ASG. My role continued through construction administration as I oversaw and was the first point of contact for RFI's, submittal's, and ASI's. The project is currently still under construction with a completion date set sometime in late 2018. A construction webcam is available below. Construction Administration Site Visit. HUB Building tree protection inspection.